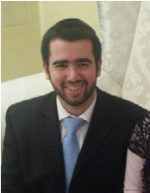 RABBI MICHAEL FUZAYLOV was introduced to Emet as a student over a decade ago and has been part of the Emet Outreach staff for the past five years. He attended Yeshiva University, where he finished a degree in Sociology, along with a pre-med curriculum in 2009. He went on to learn in Kollel in Yeshivas Zichron Aryeh for the next six years. Rabbi Fuzaylov spearheaded and continues to direct our popular Beit Midrash program in Yeshiva Chofetz Chaim. He has now joined Emet full-time where he and his wife, Mrs. Dina Fuzaylov are part of the Emet Young Professionals/Married Couples division. He’s the coordinator of our flagship fellowship program in Forest Hills, and is a lecturer on college campuses.